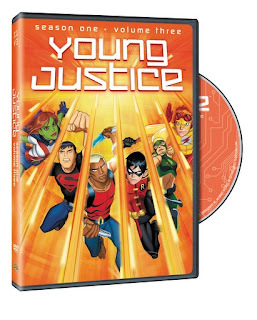 YOUNG JUSTICE continues their missions and training in this Season One Volume Three DVD. The team consists of Robin, Aqualad, Kid Flash, Superboy, Miss Martian and Artemis. We also see some familiar hero favorites as well, like Red Tornado who is now the teams supervisor, Black Canary who serves as the teams trainer and we even see Batman and some of the Justice League stop by sometimes which really adds to the awesomeness of this cartoon series. Another enjoyable standout for this series are some of the names who lend their voices for the cartoon; Danica McKellar is Miss Martian, Jesse McCartney is Robin, Bruce Greenwood as Batman and there are lots more that round up this great cast of familiar names! This DVD includes four action-packed episodes that shows the team defending the world including their own Mount Justice. We see more villains show up like Cheshire (voiced by Kelly Hu), Ra's al Ghul (voiced by Oded Fehr), Psimon, some of Red Tornado's evil family and more. I guess the best thing I enjoy about Young Justice besides the awesome cast is the great animation which continues the same style that Batman: The Animated Series kicked off with years ago and has continued on with all of the DC cartoon series since. The only flaw is some of the cheesy stories and dialogue we get but you have to remember that this series is aimed for a younger generation.